The Lawrence Medal for the best exhibit at an RHS show for the year 2012. 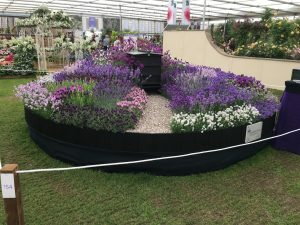 Awarded for our exhibit at Hampton Court Palace Flower Show. The Colin Spires Herb Trophy for the best medicinal or culinary herb exhibit at an RHS show for the years 2012 and 2017. The Williams Memorial Medal for the best exhibit of a single genus at an RHS show for the year 2012. The F E Rivis Prize for the person who grew the plants for the Williams Memorial Medal 2012.